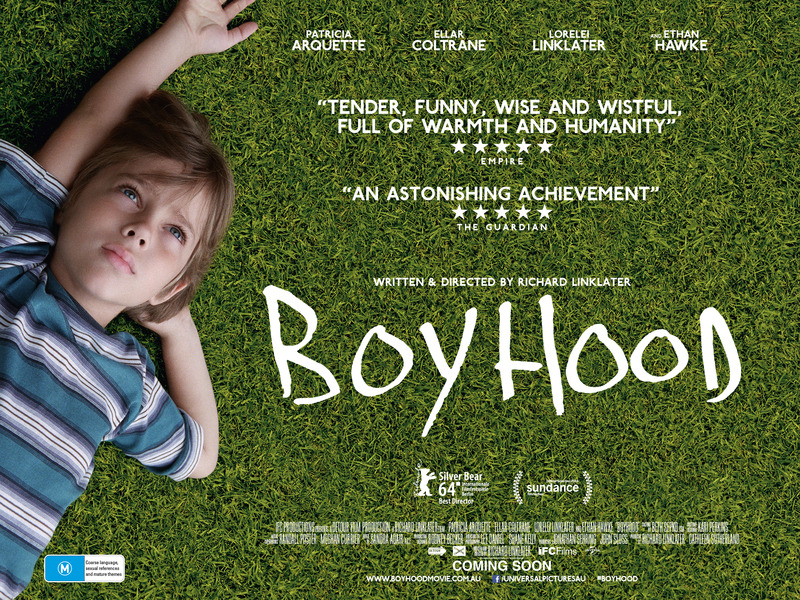 I recently saw Richard Linklater’s film “Boyhood.” It follows a little boy named Mason Evans Jr. and his family from when he was six years old all the way to when he turns eighteen and goes off to college. The film’s gimmick–which never felt gimmicky–was that Linklater made the movie over twelve years so he could use the same child actors to play Mason and his sister all the way through and capture them as they age. The film was almost three hours long, but it was touching and kept my attention. The heart of the film is Mason’s fierce mom, Olivia, a role for which Patricia Arquette won an Oscar. Mason’s parents are divorced, and Mason’s dad, Mason Sr., played by Ethan Hawke, is a kind of lost and befuddled soul who just wasn’t ready to be a dad when the kids were young, but is nice enough to the kids. Olivia also goes through a couple of other husbands in the movie, and both of these men turn out to be awful. The story of Boyhood is really the story of Olivia transcending these relationships while she raises her kids and completes her education, ultimately becoming a professor of psychology. The men are ciphers, plot devices in her story arc, but I was interested in what Linklater intended these men to convey about manhood. Mason Sr. is a nice enough guy, but not much of a match for Olivia. The next husband turns out to be an abusive drunk. The third clearly has an anger issue. The film is called “Boyhood,” not “Manhood.” When we leave Mason, he’s 18, and seems the most like his dad, but we don’t really see how he turns out as a man or a parent. I am 45, so there’s more history by which to judge me, and more perspective for me to judge by. My Dad had a lot of anger and often took it out on me, and we didn’t get along because of it. Also, whether for that reason or some other, I have been quick to anger my whole life. I started working on my anger a few years ago, studying Buddhism and yoga so that I would not perpetuate the cycle and give my kids the same trauma I (and Mason) received. The cause of the anger for my dad, I know now, was stress, fear really, of a world changing every day, and his kids heading off into it in places where he could not really protect us. I think that all he wanted was safety and prosperity for us. It made him mad that I wouldn’t do what he knew was best. The men in the film reflect this same fear and stress in a more simplistic way (they are ciphers after all), and it makes them lash out in a way that men seem to. After watching the movie, I thought about my own dad more than I had in a long time. He died in 2009, and we had never really reconciled. At 45 though, I can see through the anger to the man he really was. Unlike the men in the movie, my dad never ran away, he never drank, and he wasn’t physically abusive. He had a hard childhood and took care of his brothers and sisters. He came on a huge adventure to a new country. He worked hard. He sent money home to his family in India. He built a community in a new country. He helped everyone he possibly could. He was always there for us. He was a great bridge player. And though I hardly ever appreciated it, he had a great sense of humor. I always viewed him through the lens of his anger and our discomfort with one another, but when I think of the challenges he faced – which utterly dwarf mine – I am filled with sympathy for him and with love I didn’t think I had in me. I am tough on my little boy, as I think every dad is, but I don’t want him just to fear me and mind me. I want him to see in me all the things I didn’t see in my dad when I was younger. This is a lesson of manhood, of fatherhood. Really great, personal review. Im glad the film brought you a new perspective. Maybe I should give the film another chance as I didnt really enjoy the film on first viewing!